The other day a flyer was rubber-banded to our porch. I assumed it was either a grass-cutting pitch or a politcal thing, but it was neither; rather, it was a flyer asking for volunteers to come help with a “board-up” on the next street over. 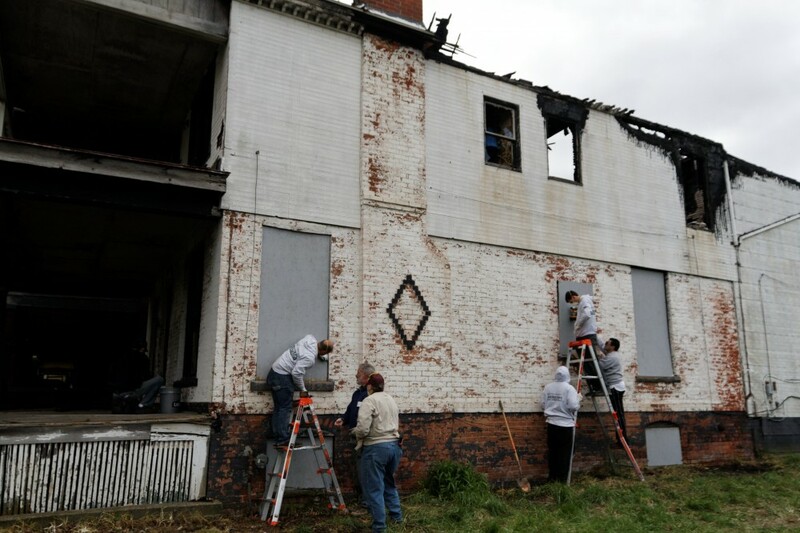 A board-up is when a group of people get together to board up an abandoned or burned-out house and clean the lots. On the north end of Woodbridge, there were a couple of burned-out houses, and they were not only eyesores but also places where people could get hurt. Why board up an abandoned home? Why cut the grass? Why trim the hedges and pick up the trash? It sends a clear signal: We care about this neighborhood. We care about what it looks like. We care about the way people treat our block. We care about the way homes are treated here, even if they’re not ours.This stuff works. A recent report from the Wayne State Police Department showed that crime in Midtown was down significantly. Serious crime—down 38% since 2008. Robberies; down 30%. Burglaries; down 30%. Auto theft? Down 53%. These stats make sense; why is crime down so much in Midtown? Because as you drive or bike or walk through Midtown it’s immediately obvious that people care. There’s very little litter. Houses are kept up. People are walking around with their kids and dogs. People smile. People wave to each other. It’s like that in Woodbridge too. My guess is that if they released the same report for Woodbridge, the numbers would be similar. The AmeriCorps Urban Safety project is designed to build a culture of neighborly communication and responsibility in the city of Detroit. In order to reduce crime in the area, we are working with local residents to create block clubs, a forum for residents to connect and create neighborhood safety strategies. The AmUS volunteers have all kinds of projects besides board-ups. They give free home security consultations. They give computer lessons to people in order to help them use technology to organize block clubs and meetings. They help build gardens. One of their upcoming projects is to build a “Sensory Garden” in Scripps Park, on the corner of Trumbull and Grand River. Myself, Lincoln, my son Perry, and our friend Jason arrived at 5259 Commonwealth around 12:30. We were immediately shown where to sign in and fill out waivers (cleaning up burned-out homes can be hazardous). We were given gloves, dust masks, and garbage bags. 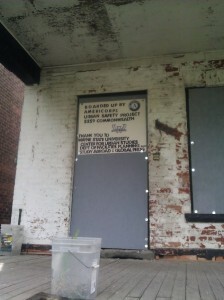 Our task was to clean up the lots around the two burned up homes, and board up the doors and windows of both. Our first task of the afternoon was to clean up the trash on the sides of the house; the area between the two homes was deeply littered with shingles, burned boards from the collapsing roof, and piles of garbage. There were a vast number of empty liquor bottles, which means people have been camping out here (presumably at night) and drinking. There was some extremely pricey liquor… if people could legitimately obtain large bottles of expensive liquor, they’re probably not going to party in between two abandoned, burned out homes. They were most likely stolen. After spending about an hour getting to know other volunteers and cleaning up the area between the homes, we moved to the back porch area. A massive tree had fallen right onto the back porch, so cleanup was pretty difficult. We had a very large dumpster but also shoveled a lot of the debris into the basement of the home. Next, we spent about an hour doing yard and alley cleanup. The alley behind the homes was filthy, covered with garbage, and overgrown. As we worked in the alley, a woman who lived in the house next to the burned out came out and thanked everybody. She began to cry as she told us how scary it was living next door to these homes, especially at night. It was touching; and it made the whole situation a lot more poignant. We were making a real impact in our neighborhood, and our neighbors truly care. I watched my son interact with some of the volunteers and I was simultaneously proud that he was doing community service and really getting his hands dirty and doing hard work, while also being somewhat ashamed that I haven’t introduced my kids to community service sooner. The next AmeriCorps project in Woodbridge is a Sensory Garden at Scripps Park. On May 4th and 5th, volunteers will help build a garden which will enable everyone (most notable disabled individuals) to experience all five senses in a natural setting. There will be plants and features that will be accessible to all five senses. If any reader wants to donate, you can find more on the official website. 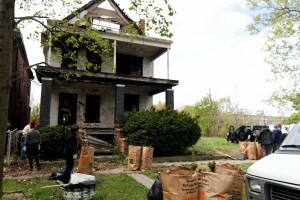 The biggest takeaway from this experience was, again, that sense of community that pervades Detroit. Every time events like this happen, the bond between community members grows that much stronger; instead of a neighborhood filled with acquaintances, the streets and corners and businesses all take the feeling of family. Detroit is the biggest small town I know. This entry was posted in Life in Detroit and tagged Community, events, Feelings, Woodbridge by primesuspect. Bookmark the permalink.